After the visit to the WHR(P) and an inspection of the new cross-town link between the Ffestiniog and the WHR(C), we ambled over to Harbour station. 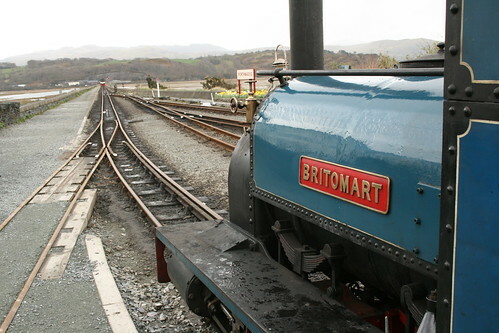 There were only two services timetabled on the Ffestiniog Railway on Saturday, so following a pint and a lamb burger in Spooner’s bar I wasn’t expecting to see a lot aside from the 13:40 train departing under a grey sky. As it happens there was a surprising amount of shunting beforehand with three locos bustling around, the sight of which took the edge off the wind and the rain/sleet/hail. 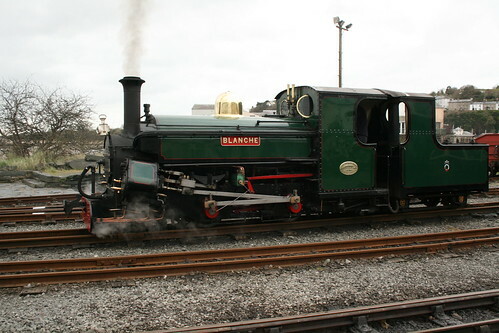 While the train engine, Blanche, was refueling at the far end of the platform, privately owned Hunslet Britomart (ex- Pen-yr-Orsedd Quarry) fetched an additional coach to strengthen the train as it was looking quite full. As Britomart brought the extra coach to the platform, another train could be seen approaching across the Cob. 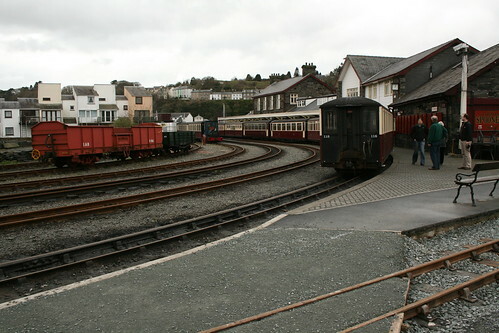 The train leading to the left of the shot is the new connection to the rebuilt Welsh Highland Railway. Criccieth Castle arrived with a one coach train. 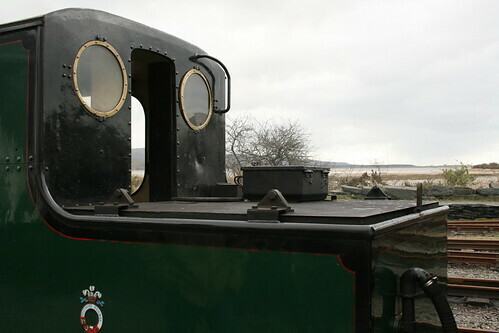 I’ve been told that it was probably laid on for a volunteer permanent way group working near Dduallt, passengers in hi-viz jackets disembarked across the track before the train drew on to park. 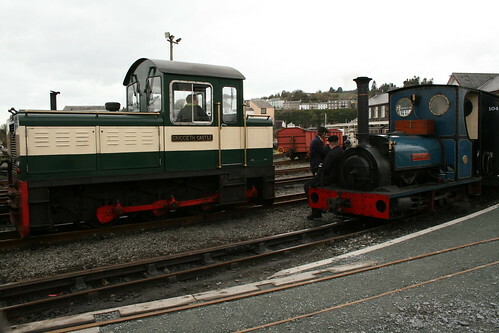 The marked difference in size between a hundred year-old quarry loco and a modern passenger diesel. Eventually Blanche ran round on the third road and coupled up for the scheduled departure. Although I’ve collected quite a few pictures to help with my ongoing Parkside/Bullant/Golden Arrow OO9 project, this was a great opportunity to take a load of detail photos for the little bits and pieces that might come in handy. 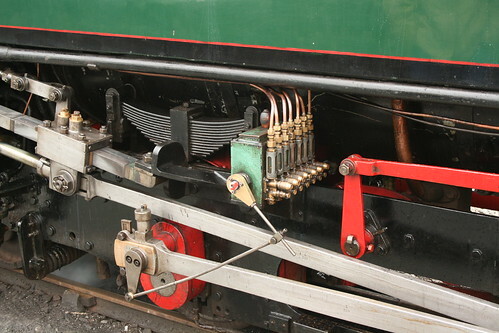 It will be particularly tricky to replicate this equipment driven off the coupling rods in 4mm scale, worth a go though! Tender detail photos seem rare, so this one will be useful. Anyone know why there’s only a grab handle on one side? Ready to go. 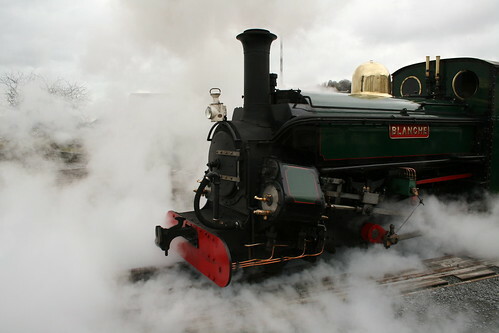 Blanche is Hunslet 2-4-0ST/T no. 598 of 1893. 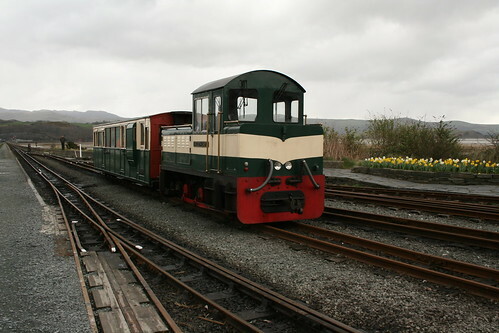 Originally built as a 0-4-0ST for the Penrhyn Quarry Railway, acquired by the Ffestiniog in 1963 and later rebuilt. Finally, in a cloud of smoke and steam and a burst of wheelslip, the train was away! 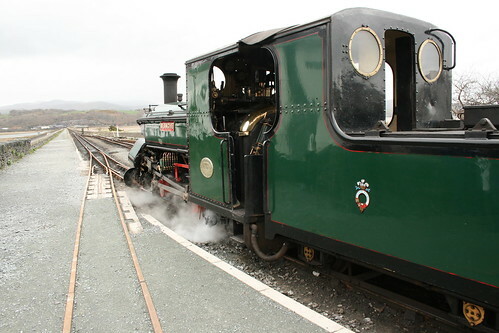 This entry was posted in 2' gauge, blanche, ffestiniog, inspiration, narrow gauge, photos, preservation, prototype. Bookmark the permalink.